Wireless technology is synonymous with life in our modern age, and it has encompassed our lives in a myriad of ways. With wireless home theater, the unsightly wires sprawling along the wall is no longer necessary. Now you can place your speakers any way that you prefer. But the market is filled with many types of wireless home theaters. To choose the best wireless home theater, we have put together some tips after going through thousands of reviews on the Internet. If you intend to upgrade your audio or video experience, these tips will help you listen to your favorite music and watch spell-bounding movies without any hassles. Check the speaker setup: Choose the type of wireless home theater that would suit your needs. 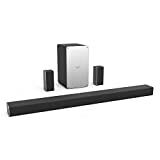 The most basic is a 5.1 speaker system, which means that there are five speakers (front left and right speakers, a center channel, and two surround channels) plus one subwoofer. You can upgrade later to a mini-theater aural experience, ranging anywhere from a 6.1 to an 11.1 system. Check the subwoofer: Examine the subwoofer that comes with the system. The sub-woofers, also referred to as low-frequency effects, assist in capturing all the low-frequency or bass sound that helps in making the music more tangible than just audible. For instance, if there is thunder, you would be able to feel the vibration. Check the power rating: Look for the power rating and the impedance. The power rating will help you understand the amount of energy the equipment requires to run. If the speaker comes with low impedance, it will enable more current to pass through, resulting in louder volumes. Opt for a speaker-friendly amp: Go with a speaker-friendly amp: if the amp isn’t designed to handle low-impedance speakers, the amp may overheat, because it is drawing more current when the volume is turned up.